What will happen to the Miss Sprint Cup social media accounts? The social media accounts for Miss Sprint Cup changed their bios for the final time on Tuesday. Miss Sprint Cup’s social media pages have nearly 1.3 million likes on Facebook, 136,000 followers on Twitter and 75,000 followers on Instagram. 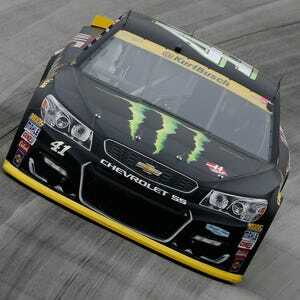 But with Monster Energy taking over sponsorship of NASCAR’s Cup Series next season, the Miss Sprint Cup program is no more. So what happens to the accounts? Kimberly Meesters, Sprint’s general manager for its NASCAR sponsorship, told USA TODAY Sports it was an “interesting quandary” not many companies have faced in the social media age. It’s not as simple as just taking down billboards or signs. Sprint found that Facebook lets users merge accounts, so the company will merge its Miss Sprint Cup page with the Sprint corporate page, but likely not until February. “We want fans to have time to read the farewell message and react to it,” Meesters said. But Twitter, Instagram and YouTube don’t have that option. So after much discussion, Sprint decided to leave them as a history of its sponsorship. Meesters said the accounts will remain online unless the respective social media companies choose to close them for inactivity. Sprint explored whether NASCAR wanted the accounts, but the high amount of crossover made that unnecessary. The vast majority of fans who followed @MissSprintCup already follow @NASCAR. The catch is Sprint can no longer post new content, which is why a goodbye message was necessary. Meesters said Sprint’s NASCAR rights go away Jan. 1. Fans responded to the final messages, including a graphic that listed the years of Miss Sprint Cup’s reign, and reacted with some heartfelt comments.